A chelated copper algaecide that is safer than copper sulfate. 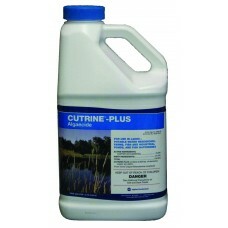 Use for surface or suspended algae. Apply with sprayer to surface, for best results use with an activator. EPA registered chemical with no water restrictions. .6 to 3 gallons per surface acre, per foot deep. Liquid is for more shallow ponds. 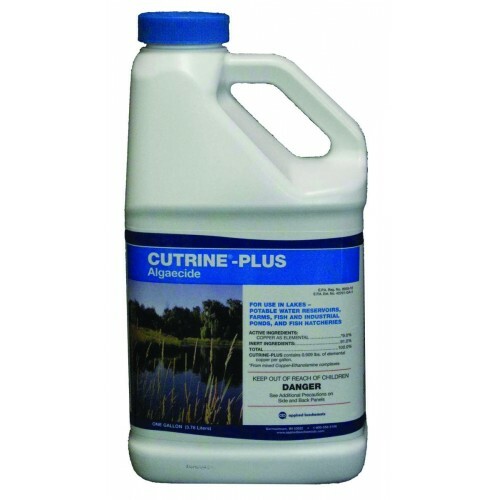 Use Cutrine Granular for deep ponds and Cutrine Ultra for thick walled filamentous algae, planktonic algae and chara, the activator is mixed in already with the Ultra. IMPORTANT NOTICE: Eagar Inc. is a chemicals distributor, and as such does not manufacture or repackage the chemicals listed in our catalog. Eagar Inc. cannot be liable for any circumstances resulting from the quality, application, or usage of these chemicals.